Flirting in Croatian – A Vacationer’s Guide is not your average language course. Nor is it just another dating book. It’s your ticket to summer celebrity, guaranteed to make you the hottest thing on the far side of the Adriatic. Available on Amazon in the U.S. and through specialty shop Heart of Croatia as well as in Algoritam stores throughout Croatia, this pocket-sized powerhouse of a language and seduction course provides you with everything you need to talk the talk with the ladies in Croatian. No matter what your style – choose from shy, smooth, smart and more – “Flirting in Croatian” will give you the tools to cruise on your trip to Croatia with over 50 prime pickup lines (broken down into categories to suit different personality types and techniques), the best compliments a girl can hope to hear, and terms of endearment you can use again and again to remind your favorite lady how she makes your heart soar. The accompanying 60-minute audio version, available online in MP3 format with the password provided in the book, allows for plenty of study and repetition, making sure prospective Casanovas can court the ladies with impeccable accents. Become a local sensation on your next Croatian vacation. 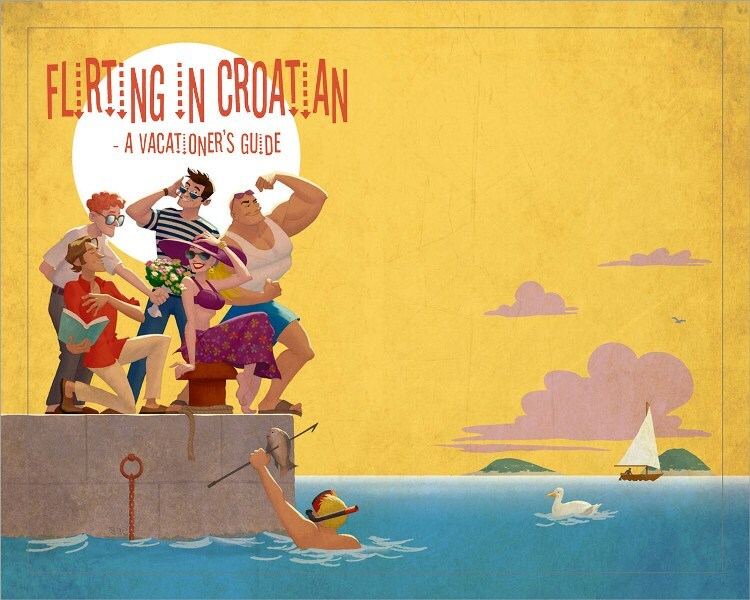 Buy Flirting in Croatian – A Vacationer’s Guide now. Thank us later. If I had legs like that, I would walk on my hands. Da ja imam takve noge, hodao bih na rukama. Zavidim tvom ružu za usne. You're a tractor plowing through my emotions. Ti si traktor koji ore mojim osjećajima. Jesi li ti Nataša, moj kontakt?